The DROID Turbo, a device we actually really like for the most part and consider to be the best “DROID” phone in a couple of years (our review), is currently included in Best Buy’s Green Monday deals. It’s still listed at $199 on-contract, but if you buy one through Best Buy, they will hand you either a $100 or $150 gift card (good luck figuring out which one they will give you). 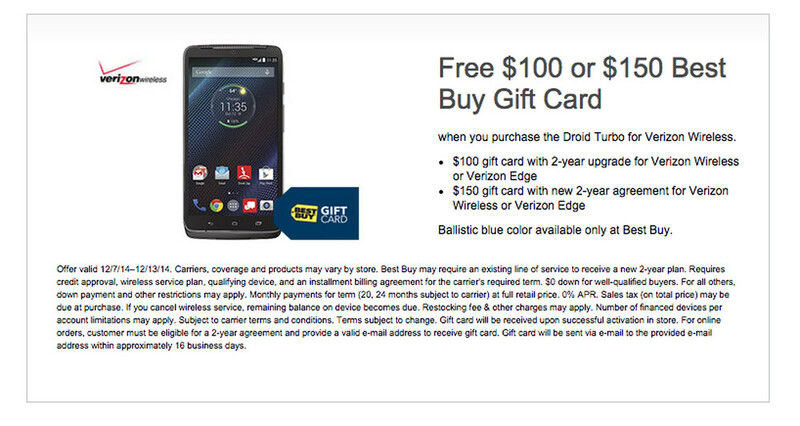 So in a way, you could be picking up the new DROID for around $50. As a recap, the DROID Turbo sports a 5.2-inch QHD display, Snapdragon 805 processor, 21MP camera, 3GB RAM, and a massive 3,900mAh battery. It also runs mostly stock Android with Motorola’s useful suite of apps added on, all of which are included in the new Moto X (2nd gen). This phone, is legit.